Addressable Market: The total addressable market for non-emergency telemedicine visits in the United States is estimated at 400+ million, approximately one-third of the 1.25 billion annual U.S. ambulatory care visits. Market Penetration: In 2016, telemedicine providers achieved a market penetration of less than .5%, reflecting an estimated 1.25 million telemedicine consultations of this 400+ million potential consults. Right-Sizing Care: Over the next decade, the aging American population is expected to place increased demands on the U.S. healthcare system. For older Americans, a review of medical records, found that 38% of doctor visits, including 27% of Emergency Room (E.R.) visits could have been replaced with telemedicine. Potential Annual Employer Savings: In a 2014 study, Towers Watson concluded that telehealth had the potential to generate $6 billion in annual healthcare cost savings for US. employers. Employer Offerings: A survey by the National Business Group on Health found that 90% of large employers expected to offer a telemedicine benefit in 2017 (in states where it is allowed); a sharp jump from 70% in 2016. Low Employee Usage: In the first half of 2016, while an estimated 70% of all employees at large firms had access to a telemedicine benefit, only 3% of these employees used the service. High Patient Satisfaction: A 2016 survey funded by the NIH (which analyzed responses from 3,000 patients treated at via telehealth a CVS Minute Clinic) concluded that between 94 percent and 99 percent were “very satisfied” with telehealth, while one-third of respondents preferred the telehealth experience to an in-office doctor visit. Demand Among Millennials: 60% of millennials support the use of telehealth to replace in-office visits. with a population of 83 million, millennials now comprise the largest segment of today’s workforce. Millennials and Convenience: Millennials place high value on convenience and limiting costs in seeking treatment. A 2015 survey, found that just 43% of millennials were likely to visit a Primary Care Physician for non-emergency treatment, as opposed to seeking a more convenient option. Healthcare Spending Today as Percent of GDP: In 2016, the OECD estimates the U.S. spent 17.2% of GDP on healthcare costs, the highest of any nation. This compare to U.S. spending healthcare spending of 14.5% of GDP in 2005. Among OECD nations, Switzerland was a distant second, with estimated spending of 12.4% of GDP in 2016. HealthCare Spending Continues to Grow: The U.S. Center for Medicare and Medicaid Services (CMS) estimates that, with an aging population, total U.S. healthcare spending will increase by 5.8% per year between 2018 and 2025, and constitute 19.9% of U.S. GDP in 2025. Healthcare Costs and Total Operating Expenses: The Society for Human Resource Management estimated that in 2015, on average, employers spent 7.6% of their operating budgets on employee healthcare costs, at an average cost of $8,669 per covered employee. Increased Employee Burden: its 2016 Employer Health Benefits Survey, the Kaiser Family Foundation/Health Educational Trust found that employers were asking employees to shoulder an increasing share of rising healthcare costs. Between 2011 and 2016, single coverage deductibles for all workers increased by 63%, single-coverage premiums increased by 19%, workers earnings increased by 11% and overall inflation rose by 6%. Emergency Room Costs: The average cost for an Emergency Room (E.R.) visit is typically cited as $1,233. This reflects the median cost for top ten outpatient E.R. visits (encounters that did not lead to a hospital admission). Of note, this reflects an NIH funded study, and the $1,233 is calculated using 2008 costs. The substantial healthcare cost inflation since 2008, means the current cost of a similar E.R. visit is significantly higher. Avoidable Emergency Room Visits by Individuals with Employer-Sponsored Insurance: A study published in 2013 concluded that 71% of Emergency Room visits by individuals with employer sponsored insurance were for nonemergency conditions or conditions preventable through outpatient care. In 2013, the U.S. had 130 million E.R. visits. Adults without Primary Care Physicians: According to a government survey, 28% of men and 17% of women do not have a Primary Healthcare Provider. Millennials and Primary Care Physicians: Among millennials, 28 percent do not have a Primary Care Physician (PCP), and another 40% do not have a relationship with their PCP. Long Waits: A recent Harris Poll survey found that 23% of people have delayed seeing a doctor because it takes too long, while an additional 13% have delayed a doctor visit because they are too busy. A study published in 2015 in the American Journal of Managed Care, by researchers at Harvard Medical School, concluded that the average doctor visit took 121 minutes; 37 minutes of travel time, 64 minutes of waiting time, and just 20 minutes of face-to-face time with physicians. Access to Care: A 2016 Commonwealth Fund study found that 51% of U.S. adults struggled to get health care at nights and on weekends without visiting the emergency room. Limited Face-Time with Doctors: While the total time involved in a physician visit often involves several hours, including travel time, waiting time, and completing paperwork, a 2017 Medscape survey found that 56% of all physician visits included 16 minutes or less of actual face-to-face time with patients. This analysis included visits to specialty and primary care physicians. Wait to See New Doctors: In 2017, the average wait for an appointment with a new Family Medicine doctor in 15 major metropolitan areas increased by 51% to 29.3 days, from 19.5 day in 2014. The average wait for an appointment with a new Family Practice doctor in mid-sized metropolitan areas was 54.3 days in 2017. Growing Shortages of Primary Care Physicians: An estimated 65 million Americans now live in “a primary care desert,” where the total number of Primary Care Doctors (PCP) can only meet 50% or less of the population’s needs. By 2025, the Association of American Medical Colleges projects U.S. shortages of PCP’s will increase significantly. Shortages of physicians in rural areas are high, and increasing. While approximately 15% of the U.S. population lives in rural areas, only 10% of the nation’s physicians practice in rural areas. Growing Shortage of Specialists: In rural America, shortages of specialists are particularly acute; with an estimated 40 specialists for every 10,000 Americans living in rural areas, as compared to 134 per every 10,000 urban residents. 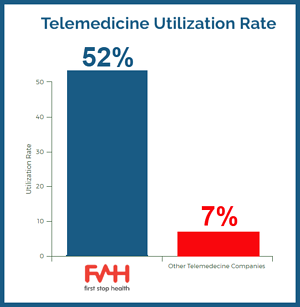 Average Usage: First Stop Health’s average usage rate, across its entire employer base, averaged 52% in 2017, seven times the industry average for telemedicine services purchased by employers directly. Average Consult Wait Time: The average wait ti me for a call-back for First Stop Health virtual consultation is less than five minutes. Right-Sizing Healthcare: On average, 92% percent of First Stop Health consults treat, or recommend treatment, for covered employees and their families with a lower cost option than the patient would have chosen without a telemedicine service. (Such as advising a worried parent that a sick child can wait until the next day to see a doctor, as opposed to visiting the Emergency Room in the middle of the night). Health Care Savings and ROI: With an average utilization rate of 52%, First Stop Health saves a typical employer, with 1000 employees, $112,500 by redirecting care to appropriate lower-cost alternatives; which yields an average ROI of 115%. These savings do not include any estimates for the value of avoided follow-up visits, increased employee productivity, reduced claims experience or intangible employee benefits, like improved health through earlier treatments and reduced stress.